Today we depart the USA for our first destination of this incredible journey, Amman, Jordan. Meals and beverages are served in flight. Upon arrival in Ammen we are greeted by our Pathfinders representative and escorted to our motor coach. After a panoramic tour of the city we arrive at our hotel. Dinner and overnight Amman. 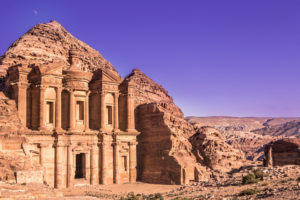 We depart this morning and travel to the “lost” city of Petra. We visit the Siq, a mile-long gorge containing multiple structures carved into the mountain. Then we continue on a walking tour where we visit the Petra Museum. Enjoy an afternoon at leisure. Dinner and overnight in Petra. Our journey today begins visiting the famous crusaders castle, Castle of Kerak. We then make our way to Madaba, where we visit St. George’s Church, which houses the oldest preserved mosaic map of the Holy Lands. Next we visit Mt. 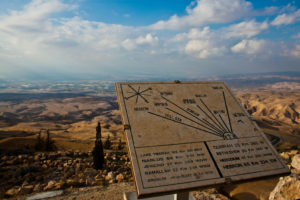 Nebo, the most revered holy site in Jordan. Moses climbed this mountain and it is also the place where he died and was buried. We then return to Amman for dinner and overnight. This morning we fly to Tel Aviv and are met by our Pathfinders representative who take us to our motor coach. We then enjoy a stroll through Jaffa’s Artists Quarter. Jaffa is where St. Peter revived the righteous woman Tabitha. We continue through Tel Aviv making our way to the beautiful Mediterranean Sea for the evening. Dinner and overnight in Netanya. 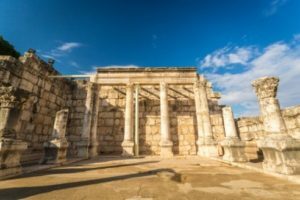 We depart Netanya this morning and travel to Bet Shean where we view the magnificent remains of this ancient Roman City. We continue on to the baptismal site of the Jordan River where you can be baptized or renew your commitment to Christ. We conclude our day by traveling to the Sea of Galilee. Dinner and overnight near the Sea of Galilee. Following in the footsteps of Jesus, we board a woodenboat for the “other side” of the Sea of Galilee. We cross the Jordan River near the site of Bethsaida and arrive in Capernaum, the city of Jesus. We visit the House of Peter and the synagogue where Jesus taught. We make our way to the Mount of Beatitudes where we read the Sermon on the Mount and then continue on to Tabgha where Jesus performed His miracle of the feeding of the 5,000. This afternoon we travel to Nazareth, the hometown of Jesus, to see Mary’s Well, the Church of Annunciation, and Church of St. Joseph. Dinner and overnight near Sea of Galilee. We start our day with a drive up the Mount of Olives for a panoramic view of the city of Jerusalem, the same view that Jesus saw when he looked out over the city so long ago. We continue down the Palm Sunday road to the Church of Dominus Flevit. We visit the Garden of Gethsemane with its ancient olive trees and the Church of All Nations. We then make our way across the Kidron Valley to visit King David’s tomb and the Upper Room. In the afternoon, we journey to West Jerusalem. We pass by the Israeli Parliament, called the Knesset as we make our way to the Shrine of the Book to view the Dead Sea Scrolls. We continue on to Bethlehem where we visit the Shepherds’ Fields and the Church of the Nativity, built over the grotto where Jesus was born. We conclude with leisure time to shop the beautiful Olive Wood crafts and return to Jerusalem for dinner and overnight. 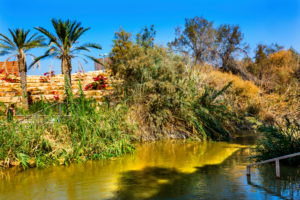 This morning we travel north along the Jordan Valley to visit the 10,000-year-old city of Jericho and Elisha’s Springs. We pass through the Judean Desert to the lowest point on the face of the earth, the Dead Sea. 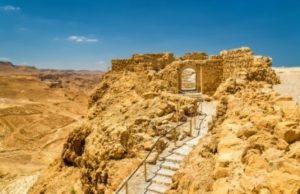 Here we ride a cable car to the summit of Massada, Herod’s luxurious winter palace and the site of the Zealots’ heroic last stand against the Romans. We enjoy a float in the Dead Sea before continuing to Qumran to see the caves where the Dead Sea Scrolls were discovered. Lastly, we visit the Tomb of Lazarus and the House of Mary and Martha in Bethany. Dinner and overnight in Jerusalem. 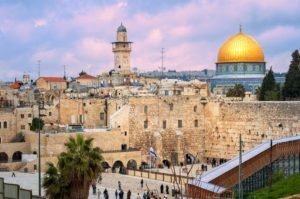 Today we experience what is sure to be the high points of our trip as we take a walking tour in the Old City of Jerusalem. We visit the Western (Wailing) Wall and see the original stairs where Jesus once preached. 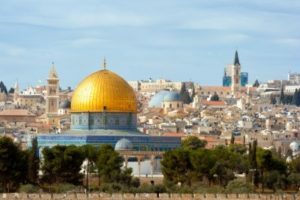 We continue up the Temple Mount to view the Dome of the Rock and the Mosque of El Aqsa. Proceeding through St. Stephen’s Gate, we visit the Pools of Betheseda and St. Anne’s Church. We then stand on stones where Jesus stood at Pilate’s Judgment Hall under the Ecce Homo Arch. We continue on the Via Dolorosa to the Church of the Holy Sepulchre. After lunch and a candlelight visit inside an authentic rolling stone tomb from the time of Jesus (“Tomb of the Kings”), we conclude our day with prayer and worship at the Garden Tomb to commemorate our Lord’s crucifixion and resurrection. This evening is at your leisure. Overnight in Jerusalem. This morning our journey takes us from Israel to Egypt. We will cross the border at Taba before making our way to St. Catherine for the evening. Dinner and overnight in St. Catherine. We make our way this morning to the beautiful and historical Sinai Mountains. 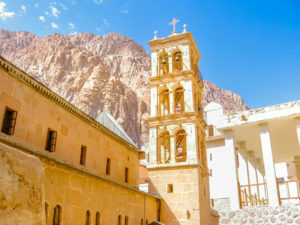 We begin our tour at St. Catherine Monastery, set beneath the Mt. Sinai where Moses received the Ten Commandments. We enjoying viewing the monasteries collection of manuscripts and icons, second only to that of the Vatican. We then visit the Chapel of the Burning Bush, which lies directly on the site of the Burning Bush. We follow the route of the Biblical Exodus as we make our way to Cairo crossing the famous Suez Canal. Dinner and overnight in Cairo. 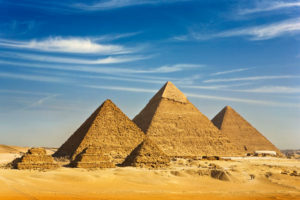 Today we journey to see one of the Seven Wonders of the World, the Pyramids of Giza! We visit Old Cairo, starting with Saint Virgin Mary’s Coptic Orthodox Church, also known as the Hanging Church. We continue on to St. Sergius, a 5th century basilica built on the cave where the Holy Family stayed. Our journey then takes us to the Synagogue of Ben Ezra, the oldest Jewish synagogue in Egypt. We then enjoy exploring the spices and silks at Khan el-Khalili, a medieval bazaar. After time at leisure, we return to our hotel and prepare for our farewell dinner cruise on the Nile River. Overnight in Cairo. We drive to the airport in Cairo for our flight home, taking with us wonderful and inspiring memories of our pilgrimage, which will be treasured and relived for the rest of our lives.